I’ve lived aboard for last year, so all is well maintained and ready to sail. Heaps of gear included (for living aboard and boating), tons of spares and tools. Purchased January last year with a reliable 2004 15hp long shaft Mariner and new in 2011; Dave Giddens main sail. 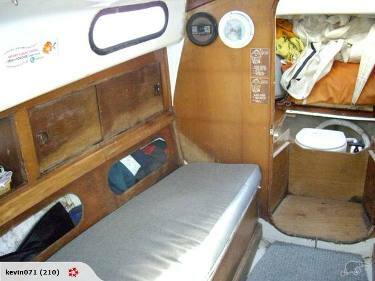 Has a Uniden Solara VHF, Ultra battery, switchboard and automatic Johnson bilge pump. Whale Gusher manual bilge pump installed in cockpit. 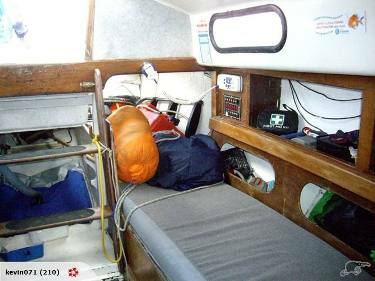 Comes with 1,2 and 3 Genoas in usable condition and a spinnaker along with pole. Glass Spider was repainted with international Toplac in March 2012 and a Hummingbird thruhull depth sounder fitted. 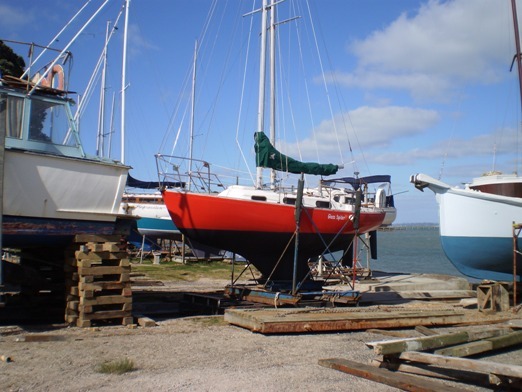 Mast lifted this year and all Stays replaced by Northland Spars and Rigging (5mm sides, 6mm fore and aft). LED anchor light fitted along with LED bulb in running light and new GME stainless whip antennae fitted at same time. 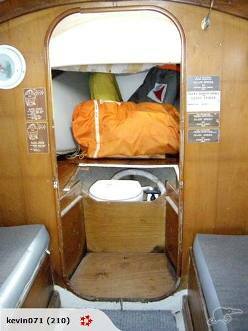 Squabs are in good condition and a modern manual Jabsco loo without holding tank is fitted. Last lifted and cleaned 6 months ago. Windows replaced when boat repainted in 2012, new Ultra battery last manth charged by a five watt BP solar panel. Fitted with a stainless swim ladder and 2 white horseshoe lifebuoys. Comes with a Manson plough, chain and warp along with all the normal sheets etc to operate her. Glass Spider is a great well mannered boat and we love her looks and performance. All the time consuming things like the electricals and stays are all done. She has served us well to get back into sailing and we have cruised for up to a week with 2 young kids along with racing 2 handed in over 30knots of breeze no problem. Very fun and reliable boat that copes with whatever conditions we've had her in. Will negotiate to keep motor if required. Reason for selling ...... am not allowed to run a two boat campaign as wife needs a new kitchen! Back on March 21, 2011 Paul and Lisa Parsonage checked in as the new owners of Glass Spider. Paul is back in the fleet as his parents were prior owners of Summer Haze. 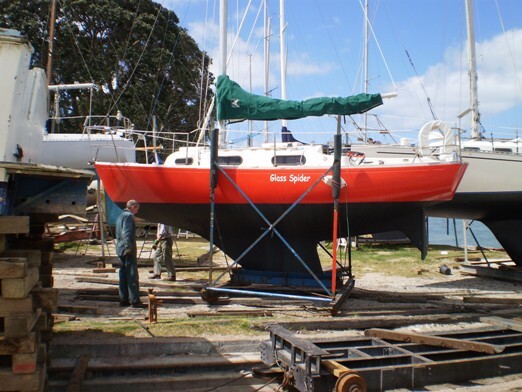 We'll start with Glass Spider's 'after' photo, just relaunched in Whangarei after getting her stunning new look. Yes, we are the new owners of Glass Spider. 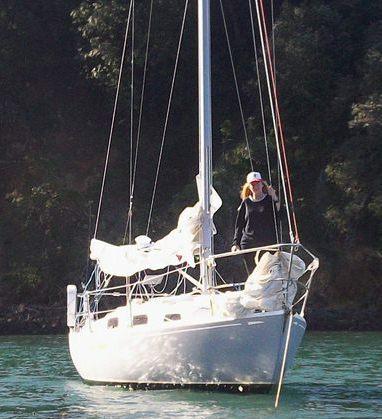 Took her over in January, sailed up the coast to home in Whangarei and hauled her out for three weeks of hard work. Have attached a before and after photo for your site. More photos to come ........... promise! My parent's S&S Summer Haze had a baby stay like Giles (Grimston, Summer Wine), but mine never has, although the mast has been set up for it at the spreaders (suspected original alspars section). We took Glass Spider up north to Whangaruru for 4 days over new year (photo to come scanner has just died!) 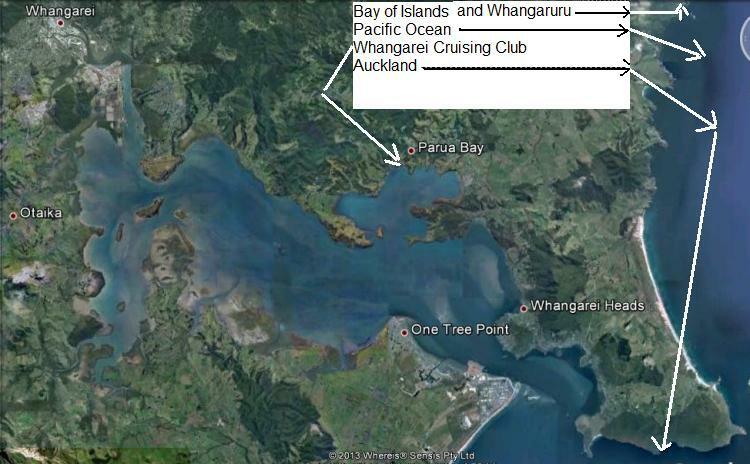 and prior to that we (Lisa and I) did the 2 handed racing series with the Whangarei Cruising Club. We are contemplating moving Glass Spider down to Auckland for more professionally organised racing. Whangerei Crusing Club keeps popping up as a place where our boats go so here's a "chart"
Raced 3 races, smallest and oldest keeler, had to retrain Lisa as I taught her to sail on 28 and 31ft racing multihulls and this leaning was a new novelty! Ended up coming 6th out of 17 but only 3 of us completed all the races, first time I’ve experienced 1 out of three being discarded! But boy did we have fun. First race, consistant 25 knots 1 reef and no 3 up, screaming along keeping up with a 32 ft long keeled cruiser. 2nd race, 30 knots consistant same set up, issues with keeping the kettle on the stove for cups of tea. No idea of speed but we were surfing down the waves seriously in need of a number 4 jib and should have put another reef in! 3rd race nice light one, 15-20 knots variable, full main and number 3, should have had number 2 jib up and gone for a dive and cleaned the hull. In conclusion, lots of fun, looking forward to two handing with kite and am currently trying to find a second hand number 4. At this point we begin the history of Glass Spider as we know it. 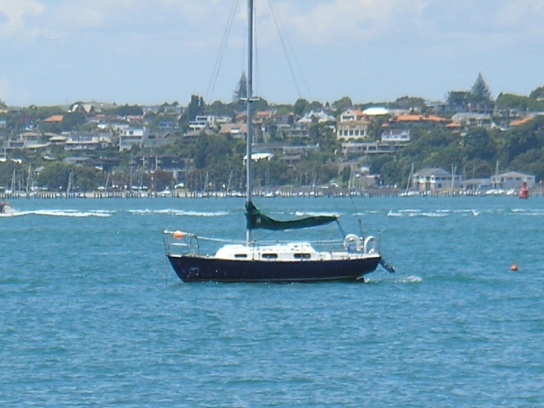 Lisa and Paul bought the boat from Kevin McCready who had her for about one year and kept her in Waitemata Harbor, Auckland. Kevin bought her from Sioban Hall who had her for a couple of years. Her name was Rapallo under another previous owner (Lou). On December 27, 2011, Giles Grimston (Summer Wine) brought the following ad for Glass Spider to our attention. Here is the link http://www.trademe.co.nz/a.aspx?id=435256431. The ad had an interesting additional link to questions and answers about the boat http://www.trademe.co.nz/a.aspx?id=435256431#qna that no longer appears to be up. We posted comments from the previous owner, Lou, at the bottom of this page. Solid safe full-keeler. Original SS24 pocket cruiser, more solid than the NZ Falcon. 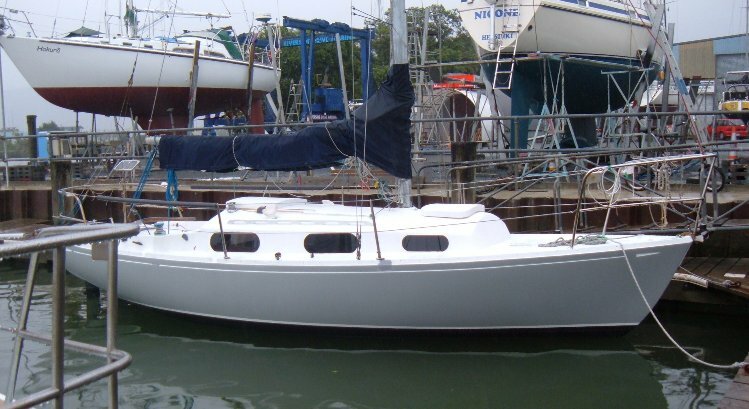 Ideal first keel boat. Forgiving (ie very hard to tip up). 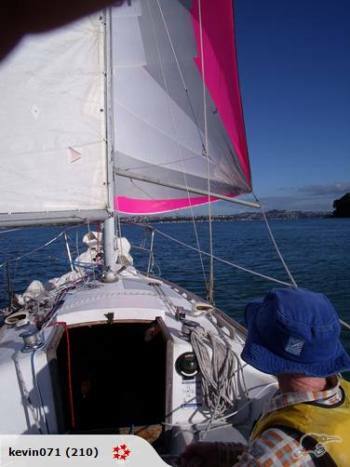 Sailed solo Kawau to Auckland in 40 knot tailwinds recently. 1. Brand new battened mainsail (three reefs, flexible batten cars) and new storm jib (worth $2771.04). These photos, and more, are in the ad. Glass Spider is below - before and after her new topside paint job. October 14, 2010. We received the following email (edited) from the new owner of Glass Spider, Kevin McCready. I'm the new owner of Glass Spider which I bought from Siobhan Hall. She was lovely to deal with and very generous in all the equipment she left on board. Apparently it's an earlier "real" ss24 with the three windows and not the NZ modification known as a Falcon. At this point we shift to the record we have from previous owner, Siobhan Hall. On February 4, 2008 we received the following emails from Siobhan and a picture of Glass Spider on her mooring. Af this date we had pictures of several Falcon 24's but no S&S 24s. This is our first. For more information on S&S 24s click here. 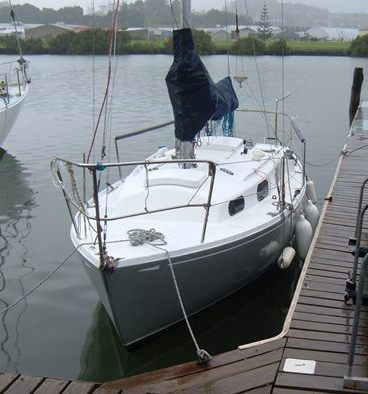 I have recently brought a SS24 in New Zealand, not knowing much about this boat have been looking on the web and come up with your site. 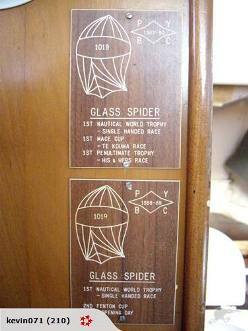 My boat is named Glass Spider and has the sail number 1019. She has the cut away in the transom for the outboard, and having read the site her found that she must be pre 73, something that I didn't know. 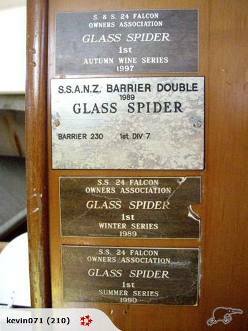 Previous owners have raced her with the now defunct SS owners association and there are several plaques on the bulkhead in the cabin to prove some success. The boat, as she sits in the water today is rather sad in her appearance but hopefully with some paint and TLC this will improve when she is next taken out later this year. 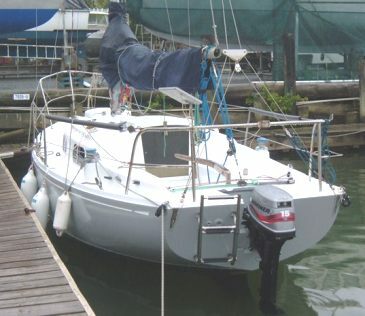 She has had the halyards brought back to the cockpit which makes short handed sailing much easier. I plan to install tiller pilot for next season which will make solo sailing easier as this is how she will be used mostly. My crew not being of much use as he is a dog. We make an unusual team out there canine crew and female skipper, but that makes the sailing none the less enjoyable on this very forgiving little craft. I am sorry to say that I have no knowledge of Natine, but will ask around, not that I know many other SS 24 or Falcon owners. I am happy to say that after a wet and difficult winter to do any work on my boat I am now getting some good use out my 'Glass Spider,' I am planning a trip or Great Barrier Island this year, its about 50 miles off shore and a biggie for me, I know that the boat will be fine as its been there many times before, she bares the plaques from races and cruises in the 80s and 90s with previous owners. 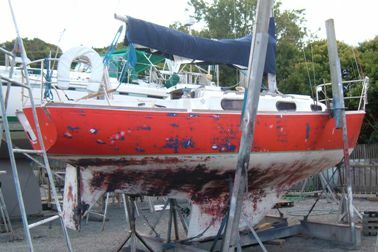 Over the winter months I replaced the toe rails and grab rails and next winter plan to paint all the top sides, she really need a generous lick of paint. I was out yesterday with two friends and we had a very pleasant day on the harbour with a walk on a conservation island, unusually for me we ended up having to motor back to the mooring as the wind was right on the nose and rising. It was nice to have a crew for a change although, being green, they were not of much use. 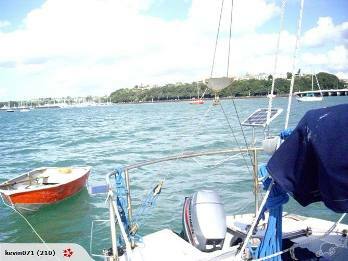 I usually sail alone, hence I have just fitted a Simrad tiller pilot. the first time out, last weekend I sailed on Boxing Day and came back the following day. The tiller pilot was great, as long as the battery lasted, which I am sad to say wasn't very long, so that is the next project, up grading the power supply, probably with a larger solar panel. While away on my Christmas trip some early owners of my boat recognised her, they owned her in the 70's, unfortunately I didn't get long enough to talk to them and find out any history. They recognised her by the cut out in the stern which drops the outboard lower to the water. This is an innovation that allows the tote tank to be out of sight below the deck line. But even with a long shaft out board I still an subject to a lot of cavitations if there is any swell, which is always where I sail. My dog is becoming an accomplished crew, always in the wrong place at the wrong time, this makes for some interesting situations, but I wouldn't have it any other way. Sorry for the ramble, its warm and humid today, overcast and reading 27C, hope this warms up your -10C a little. November 22, 2009. While most of us are raking leaves and getting out our winter jackets, some of us are just getting launched. Siobhan sent in the following email and pictures of Glass Spider sporting her newly painted topsides. Well, Glass Spider is on her way back to the water in the attached pictures, she has had a change of livery over the winter months. I had intended painting the deck and cabin top but ran out of time. I fitted a new head while she was on the hard stand so weekends will be a little more comfortable for me this season. I still want to fit some sort of water tank and get new cooker with gimbals. Other changes that I have made is fitting a sock over my spinnaker, hopefully this will enable me to use this sail single handed when the time comes. To make the sock I taught myself how to make net and knotted 10 meters of it, hopefully it will do the job. Looking forward to the summer season down her in NZ while you up north have your winters. Hi Kevin, I used to own this SS24 in the late 80s-early 90s. She was formerly named Rapallo. As you pointed out in your description, she is a Mk1, not a Falcon....Falcon's have a modified deckhead, designed by Ferris de Joux (less attractive, larger cockpit, less volume below, shorter boom). Has beaten Raven 26's on the water (elapsed time). Happy to assist with any info you'd like. I renamed her when I did a major refit, ran all halyards to the cockpit, pulled the rig out to run halyards inside the mast & also conduited wiring for masthead light, fitted backstay adjuster, dumped the Murray side handle sheet winches & added halyard winches to cabin top & the list goes on. Reactors, Ravens, etc., have a waterline length advantage in moderate to fresh breezes. Whoever buys her will get a pretty bullet-proof boat. I sure got my share of value from her.